I'd like to say that I'm never jealous of my married/parent/'together' friends. :) I can't. There are still days that I think, 'What am I doing?? THIS is where I am in life? What the bloom is going on? Look at her/him/them! Now THEY'VE got it together!' It never lasts too long, as I realize that my singleness has blessed me with opportunities and experiences that my married/parent/'together' friends won't have the chance to partake in. Most of time, I'm good with where I'm at-even though I don't know where that is ninety percent of the time. However, I've realized one thing over the years, as many of my friends have gotten hitched and/or started families. It changes things. I'm not going to get into how it changes things for people getting married or becoming parents, I think we all know. I'll just say that, for me, it's changed things. It's left me in a place I wasn't prepared for when I was younger. I never expected the vast majority of my friends to be a such a different place in life as me. I never expected to be single in my late twenties. So, even now, years into my adult life, I often find myself being pulled two different directions. I spend half my time trying to embrace my unique situation(I know it's not completely unique. I do realize I'm not the only single person my age) and half my time trying to figure out if I fit/ wanting to fit into a group. 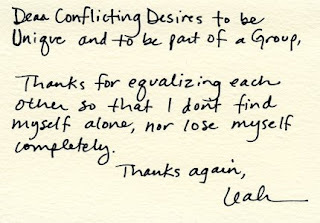 And unlike Leah, it's left me feeling lost and lonely at times. I'm still trying to strike the right balance in my life. I'm not really sure how to do it.